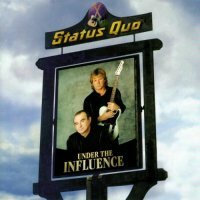 Back in 1999, Status Quo issued their twenty-third album, 'Under the Influence'. Sandwiched between two cover albums, 1996's hugely successful 'Don't Stop' and 2000's reasonably successful, but much maligned (by critics, fans and band members alike!) 'Famous In The Last Century', 'Under The Influence' was an almost entirely original album - and for my money, a very underrated one. The album begins with the excellent 'Twenty Wild Horses', a favourite of Francis Rossi who penned it with Bernie Frost. The track was given an airing in Rossi's solo set list on his recent tour, along with another '...Influence' track 'Blessed Are The Meek'. Both are terrific songs, if slightly less intense than usual Quo fare. Rick Parfitt performs particularly well on this album, penning the tuneful Rossi sung 'Little White Lies' and singing one of my favourites on the record, 'Little Me And You', which is a fantastic rock and roll song that you could see Elvis doing - indeed, there's the odd trill by Rick which is even a little Elvis-esque. On top of that, the band deliver a strong cover of 'Not Fade Away' and the new reissued version adds three extra tracks - one is a live recording of 'Twenty Wild Horses' done at 'Night Of The Proms', the others are covers of 'I Knew The Bride' and 'Sea Cruise'. Both of these covers are done with skill and help make the album even better. I think the record is worthy of reissue because it was a very well crafted album - it's a bit more mature than some Quo stuff and allows them to stretch their songwriting without totally breaking the boundaries. There's stuff on here that you could play to someone anonymously and they wouldn't necessarily know it was Quo. Francis suggested to me in my interview with him this issue that the band were very happy with the album and were very disappointed to the indifference it received. Rossi felt the original sleeve, which depicted he and Parfitt on a pub sign, followed by a promo tour of pubs, killed the interest in the record. 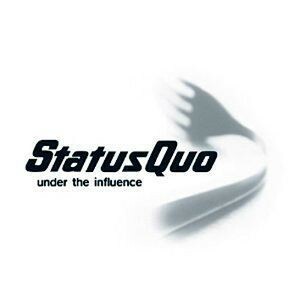 The reissue comes in the band's original choice of sleeve, a plain white cover simply featuring the Quo logo and a bent fork. I personally think the album is much better than most gave it credit for, and the reissue means that a lot of Quo fans have a chance to reacquaint themselves with it and get some bonus tracks for their trouble. If you missed it the first time around, I'd suggest giving it a try - it's not typical Quo, and you might well be pleasantly surprised.